Embossers leave a raised impression of your seal on documents, and can act as a watermark to prevent forgery. All of our embossers have heavy duty frames and precision parts for the finest impressions every time. Choose from a Desktop model, designed to produce impressions with minimal effort, or a convenient Pocket Seal Embosser to carry with you on the road. Impression areas are 1-5/8" and 2" diameters. 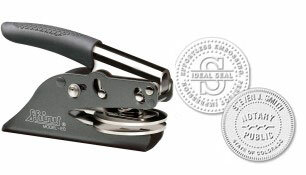 If ordering an embosser for notary purposes, please provide a copy of your State Notary Certificate. If you experience any difficulty or need assistance with your order, please call us at 253-383-5433 or e-mail customer service. We are happy to help and can set up the order for you if needed. *Machine style may vary from photos.